Constructed at Cockatoo Island Dockyard in Sydney from 1952 to 1959 and commissioned into the Royal Australian Navy (RAN) only a day after completion, HMAS Vampire (D11) was the last of three Daring-class destroyers built for the RAN from late 1940s to late 1950s. 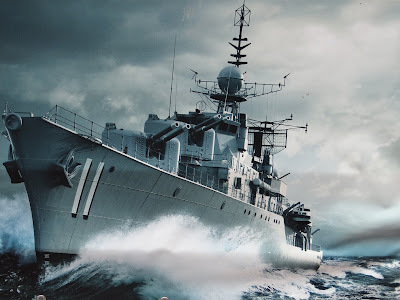 Along with sisterships HMAS Voyager (D04) and HMAS Vandetta (D08), HMAS Vampire was designed as a versatile, multi-purpose ‘Gun Ship’ with three separate weapon control systems to control the main and secondary armament. In Naval Gunfire Support (NGS) mode, the main Gunnery Fire Control System was capable of providing accurate and rapid fire to a range of approximately nine nautical miles. In normal mode, range could be extended in excess of ten nautical miles. Vampire's main armament comprised of six 4.5-inch (110 mm) Mark V guns mounted in three (two forward and one aft) Mark 6 twin turrets. Anti-aircraft outfit comprised of six 40 mm Bofors with two single mountings on the forward superstructure and two twin mountings on the aft superstructure. Four 0.5-inch (13 mm) Browning machine guns were carried for point defence. For anti-submarine warfare, Five 21-inch torpedo tubes were fitted to a single Mark IV mount on the deck between the forward and aft superstructures while a Limbo mortar was carried on the aft deck. Simiarily with fellow Daring-class destroyers, HMAS Vampire benefitted from a number of refits during her career which included various upgrades and improvements, not just to the ships habitability, but armament and combat suites. During a refit between 1970- 1972, the forward superstructure was rebuilt with the primary aim to enclose the open bridge area. 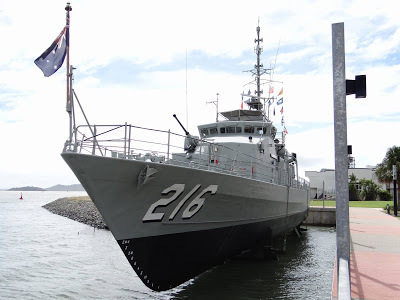 In 1979, it was announced HMAS Vampire would be converted to a training ship with a number of required modifications completed including the installation of a training classroom in 1980. The Vampire remained in this role until leaving active service and decommissioning from the RAN in 1986. She was later presented to the Australian National Maritime Museum for preservation as a museum ship. Sadly, sistership HMAS Voyager was lost (collision - sunk) along with 82 lives in February 1964 when the destroyer crossed the bows of the aircraft carrier HMAS Melbourne while conducting post-refit trials at night off Jervis Bay south of Sydney. The other Daring-class destroyer, HMAS Vandetta, was decommissioned in 1979 and later sold for scrap.